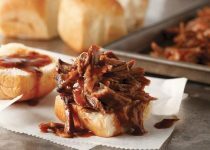 " This is the best pulled pork recipe giving that Smokey taste without the time or hassle of being in a smoker." 1.Pierce pork shoulder with a fork splash with Chicken Chili Lime working it into the meat. Let rest for 1 hour or overnight in fridge. 2. Remove pork from marinade and rub with smoked garlic seasoning. 3. Place pork shoulder in to slow cooker with 1 can of your favourite Canadian beer, chopped garlic cloves and remaining Chicken Chili Lime. 4. Cook on low heat in slow cooker for 5-7 hours. 5. Remove pork and shred with a fork. 6. Add Smoked Garlic Grilling Sauce to shredded pork before serving. 7. Place pork on bun with your favourite slaw, slice red onion, pickles or cheese as garnish. Note: Pulled pork is an excellent topping to your favourite poutine recipe. Optional: Inject 3 ounces of Chicken Chili Lime splash into pork shoulder using a marinade injector. Place pork shoulder into smoker and cook with hardwood chips to an internal temp of 180 degrees Celsius, then finish in slow cooker.